The bane of many greyhounds: Corns. Corns are only found in sighthounds, including greyhounds. Not every greyhound gets them, but when they do, they’re extremely painful. And treating them can be hit or miss. In this episode, we sit down with Patty Comerford to get the skinny on theories as to what corns are, how to detect them, and a myriad of treatments that may put the bounce back in your greyhound’s step. If you’ve been enjoying this podcast series, please consider making a donation to Greyhound Friends of New Jersey (GFNJ). Since 1986, GFNJ is a non-profit organization dedicated for helping former racing greyhounds get to where they need to be when they retire: Home. Print out this card and give it to your veterinarian. It explains what makes greyhound blood and their lab results different as compared to the blood of all other dog breeds. Check out TheraPaws when you need to give your greyhound relief from corns. Converse with other who are experiencing greyhounds with corns in this Facebook community dedicated to the subject. Check out and talk to your veterinarian about Kerasolv and Murray Avenue cream. 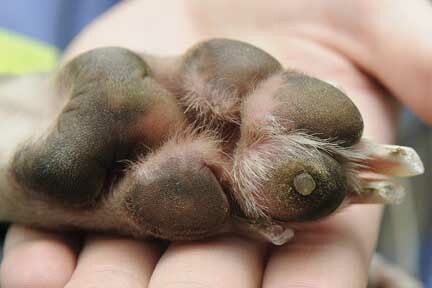 Photo of a greyhound’s paw pads with a corn. Video of a veterinarian hulling a corn from a greyhound’s paw pad. Note that your veterinarian or related medical professional should perform this procedure. Important note: Patty Comerford and Jacqueline Howard are not medical professionals. Please seek medical advice and guidance specific to your greyhound from a licensed veterinarian. The information provided in this episode of the About Greyhounds podcast is strictly that: provided for informational purposes only.